The U.S. Interior Department’s Bureau of Ocean Energy Management, which is holding public meetings on plans to open more coastal areas to offshore drilling and leasing, postponed a hearing scheduled Monday for Tacoma. The agency’s website said the place the meeting was to be held wasn’t available. The meeting will be rescheduled, the agency said. Attorney General Bob Ferguson said the state could file a lawsuit arguing the administration did not follow federal laws for changing its regulations, and that it arbitrarily exempted Florida after including that state in its initial list of coasts for more oil and gas leasing. Lands Commissioner Hilary Franz said she would assert Washington’s leasing authority over the shorelines and aquatic areas the state owns on the coast. Tribal leaders said they would assert their treaty rights, which guarantee the ability to fish and gather shellfish and native plants, which would be jeopardized by an oil spill. “We need to do more to help the ocean improve its overall health,” Chad Bowechop, of the Makah Tribe’s Office of Marine Affairs. Inslee and Ferguson also sent letters to U.S. Interior Secretary Ryan Zinke Monday, listing reasons for him to cancel any plans to open Washington coastal waters to oil and gas drilling. Inslee said, however, he recently told Zinke he has all the information needed to make that decision. On Jan. 4, the administration announced it would open more coastal areas for oil and gas exploration. The Pacific Coast could see seven new leases, with six off the coast of California and one off the coast of Oregon or Washington. There is no off-shore oil drilling currently off Washington, and state officials said they don’t think there’s much oil or gas below the ocean floor in that part of the Pacific. Larry Thevik, president of the Washington Dungeness Crab Fisherman’s Association, said the total reserves off the Washington coast might supply only 20 days of oil for current U.S. needs. 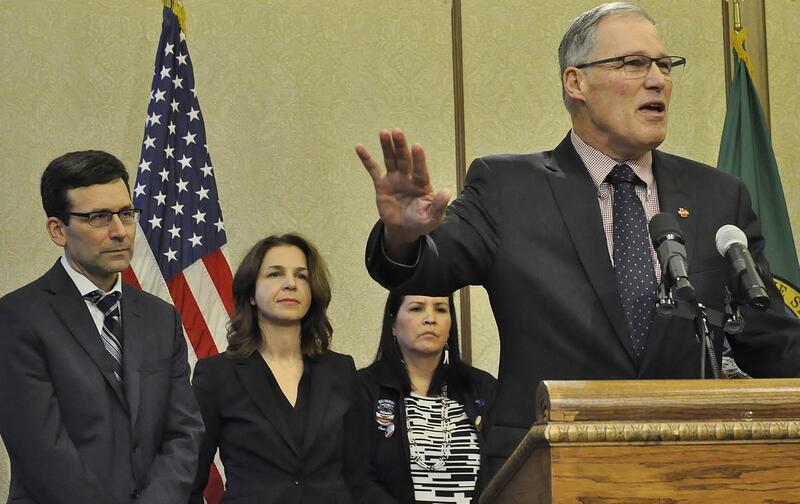 Opening it to leasing comes from the administration’s “closet of bad ideas,” Inslee said, adding that the oil and gas may exist only “in Donald Trump’s imagination.” Oregon and California also plan to fight the proposed leasing plan, he added. “Our states are not without tools to protect ourselves. We intend to use all of our tools,” Inslee said. One tool would likely be another lawsuit added to the list of legal actions the state has taken against the federal government over Trump policies. Ferguson said the state has been successful in past fights because the administration is “sloppy” in how it tries to adopt new regulations or change existing ones. The decision a few days after the initial announcement of expanded leases that the Florida coast would be removed from consideration could allow Washington to make the case the process is “completely arbitrary,” Ferguson said.